This chart was created when working with eighth graders. Students were preparing to take a state exam and needed to respond to an isolated writing prompt. Many of the students had great points to support their claims, but lacked organization and elaboration. This chart is called a bookmark because after instruction I always type up smaller versions of this and turn them into bookmarks for each student. Some teachers have simply taken clear packing tape to quickly laminate these for students. Others have taped them on student desks or inside writing folders. 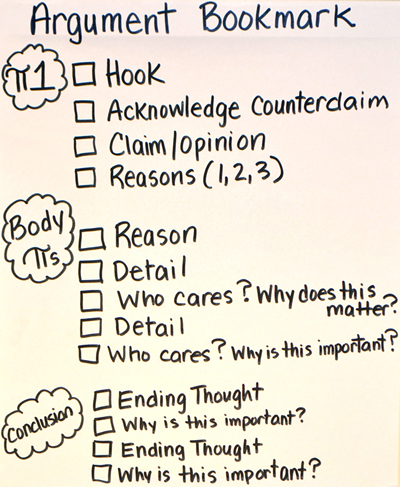 The goal is that students use it frequently so that they begin to automatically remember how to organize their arguments. This bookmark is a definite pattern for writing. I find that most students do need a pattern to begin. Without a pattern, many don’t know where to begin. The great part about introducing a pattern is that once students have a general understanding of an effective way to organize their writing, they can begin to break the pattern and individualize it. Students who struggle with organization, however, still have an effective pattern that they can rely on. Create this chart one section at a time. Consider only discussing paragraph one on the first day. Ask students to take an older topic (or assign a mock one) and practice the development of just that paragraph. Build up more each day before applying to an independent topic. Create charts to provide sentence starters for the different components.